Today I’m honored to share a special guest with you today–Kay Bratt. Kay fell onto my radar back in the summer of 2008, coincidently around the time I was adopting my son Ryan from China. Kay was about to release her first book, a memoir titled Silent Tears; A Journey of Hope in a Chinese Orphanage. Obviously, this was a subject close to my heart so I eagerly anticipated its release. The inhumanity she witnessed, the attempts she made to intervene–Kay laid her soul out for all the world to see. I was impressed and moved and knew I had to get to know this woman. I was actively blogging at There’s Always Room for One More so I emailed Kay and asked her if I could interview her on my blog. She graciously agreed. And thus began a wonderful friendship. I watched Kay’s success with Silent Tears, all while writing my own books. Kay would email from time to time and ask me how things were going and finally, I emailed her last spring. “I’m considering self-publishing one of my novels.” She was full of support and encouragement and I consider her a mentor in many ways. A few months ago, Kay told me that she was nearly done with a novel, Chasing China; A Daughter’s Quest for Truth, and asked if I would be open to beta reading it. I eagerly jumped at the chance. This was also a topic close to my heart– an adopted Chinese daughter returning to China to attempt to locate her birth family. What I read a was a beautiful story, told from the perspective of a woman who understood both American and Chinese cultures. So returning to the roots of our friendship, Kay has graciously agreed to another interview. Kay, tell us about your new book, Chasing China; A Daughter’s Quest for Truth. First, Denise, let me say thank you for inviting me to be a guest on your blog. I am so excited that you decided to develop your gift of writing into a career. I was reading your blog way back when, and your tales about your crazy life and adorable children were always one of the highlights of my week. Now I’ve read Twenty Eight and a Half Wishes and Chosen and I can honestly say that you made the right decision, because you can write! Thanks, Kay.You were a big part of where I am today. But this is about you—not me! I know why you wrote your memoir, but I’m curious how you came up with the premise for your novel. 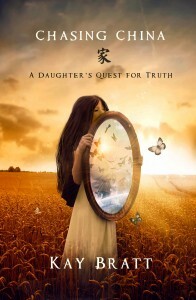 Chasing China; A Daughter’s Quest for Truth is about a young woman named Mia who was adopted from China at the age of 4. She doesn’t remember anything about her early years but she struggles to put aside her feelings of abandonment. She decides that to find peace, she must go to China and seek the truth. She hopes to find her birth family and learn why she wasn’t wanted. That sounds very interesting, and it’s timely. There are a lot of stories recently circulating about adoptive families starting searches for their adopted children’s birth families. Yes, that is one of the sources I got my first ideas for the book from. I still feel a strong connection to China and because I lived there for over four years, I have a lot of memories to pull from. I used all of those, along with tons of research and questions to the IA community to write this book. Also, I’d like to add, the children I met in the orphanage and on the streets of China are main characters in Chasing China. I hope I have written a story that is timely, but with an unexpected and worthy conclusion. Since I beta read Chasing China, I know the ending and she is right, I didn’t see it coming. Kay and I have another thing in common—we are both indie writers. Kay’s first book called Silent Tears was self published and so is Chasing China. Kay is considered a success story in the self-publishing world. Yes, Denise. I did self publish Silent Tears but after a buzz began in the adoption community and my sales became something to raise eyebrows at, a publisher approached me and offered a contract to re-launch it under their label. The AmazonEncore version of Silent Tears was published in 2010, and now the print rights have been bought again, and Silent Tears will be released November 15 under the Houghton Mifflin Harcourt label, and be available in book stores! AmazonEncore has kept my digital rights and HMH have bought the print rights, it’s a complicated scenario but a good one for me. This is the 3rd life cycle of Silent Tears—and the 3rd cover, I might add! But I am the sole owner of all rights to Chasing China. Wow. That is really amazing, Kay. I know I’ve been excited watching your continued success! (For those of you who haven’t read Silent Tears, I highly encourage you do so.) So can I ask why you didn’t go with a publisher for Chasing China? Absolutely. I have no secrets. Well—maybe a few, but not related to writing. (Lame joke alert) I decided not to pursue a publisher for Chasing China, but instead to put it out there myself. Many people who have an interest in China and adoption already know of me and I feel that I can make a decent go of it without a major publisher backing me. Silent Tears sold thousands, and I feel that at least a big chunk of those readers will also buy a second book written by me. I was in a hurry to get the story out there, and after ten months of writing it and two months of editing it, that is what I did. No regrets. Kay, thank you for guest spotting on my blog today. I wish you luck with your two book releases this month! You are a busy woman. And so am I, so with that—I’m off to more editing, writing and pulling my hair out to make these deadlines. What an amazing journey — for both of you! Thanks for posting this interview!